In each of our hancrafted batches of soap, we stuff the soap with all the goodness of full goat milk. To make our soaps feel even richer and lather more, we add heavy whipping cream. With our combination of good for your skin oils and butters, this combination helps your skin to be the best it can be! 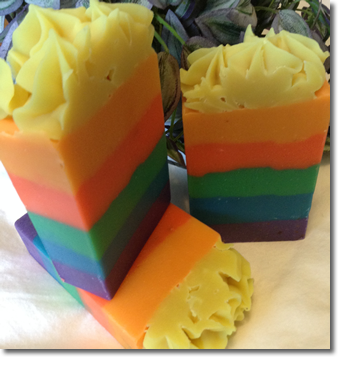 Showcasing our Rainbow Dreams full goat milk soap with Kaolin Clay and scented in our fresh smelling Island Spa scent. Yummi to look at and fresh smelling to shower with. Available for a Limited Time on our website. Get yours before they are gone. I am rather proud of our ingredients. You can check out their properties here. 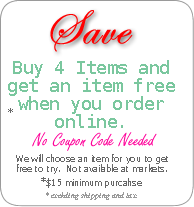 Every item that you purchase from The Natural Cottage is made to be the best you will ever use. Need a special formula to create your perfect product please ContactUs and we will create a perfect product formulated for your skin type. Start nourishing your skin today.